1526 First recorded mention as Aruba. 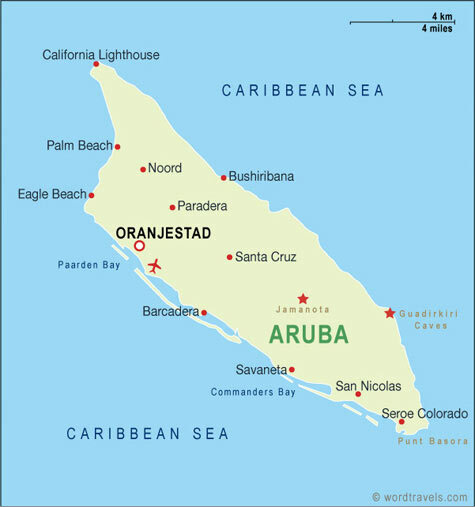 10 May 1636 Aruba a Dutch colony (subordinate to Curaçao). 1636 - 1792 Under Dutch West India Company administration. 1647 - 1664 Part of New Netherland colony (see New York). 30 Jan 1648 Spain recognizes Dutch possession of Aruba. Oct 1804 (1 week) British occupation. 12 Feb 1805 - 20 Nov 1805 British occupation. 19 Aug 1806 - 25 Sep 1806 Re-occupied by Francisco de Miranda. Jan 1807 - 11 Mar 1816 British occupation. 13 Feb 1942 - Dec 1945 U.S. occupation, Dutch administration continues. and withdrawal from the Netherlands Antilles. autonomous country of The Netherlands. occur on 1 Jan 1996) halted at Aruba's request. 1951 Frans Adrianus Jas, Jr.